S-Flex elastomeric sleeve type flexible couplings come in three different standard material types, as well as single piece, split single piece, and split two piece designs. EPDM - This is the standard material, a rubber-like compound which has the highest temperature rating (275°F/135°C) of the sleeves available. It provides good resistance to most commonly found chemicals and is not affected by dirt or moisture. This sleeve is a dull black color, can handle 1° of angular misalignment, .010" (size 3) to .062" (size 16) parallel misalignment, up to .124 inches axial misalignment, and up to 15° torsional wind-up. NEOPRENE - This material has better chemical resistance than EPDM, especially to oil, but is rated only for a max. temperature of 200°F (93°C). The color of the sleeve is black with a shiny finish and a green dot for easy identification. The Neoprene and EPDM sleeves have the same torque rating, misalignment ratings, and wind-up rating. HYTREL - This is a polyester elastomer designed for high torque and excellent chemical resistance. It carries four times the torque of the EPDM/Neoprene materials but is limited to ¼ ° angular misalignment and parallel from .010" (size 6) up to .035" for size 14 couplings. The Hytrel material is orange in color, with torsional wind-up up to 7°. When using this coupling, care should be taken to ensure the coupling is not over-sized and some wind-up occurs (otherwise tooth chatter could lead to premature elastomer wear and failure). One-piece solid - The one piece solid sleeve design is noted as the JE (EPDM), JN (Neoprene), and H (Hytrel) types, and is generally the least expensive of the rubber sleeves. It is available in sizes 3-10 for JE, 3-8 for JN, and 6-12 for H.
One-piece w/split - The one-piece split design is noted as the JES (EPDM) and JNS (Neoprene) types. This design is used for applications where the shafts are positioned closely together and the sleeve must be "peeled away" for replacement. The design is stocked by Lovejoy in sizes 3-9 for JES, and 3-8 for JNS. Two-piece split - The two-piece split style sleeve is made up of two completely separated halves. For the E (EPDM) and N (Neoprene) styles, a retaining ring is used to prevent the sleeve from extruding outward under speed. The H (Hytrel) is such a rigid material that the ring is not necessary. The E sleeve is available for size 5-16 couplings, the N sleeve for 5-14, HS for 6-14. This design is popular given its ease of installation and replacement. For high usage customers, the JE, JES, and E sleeves are available in the most popular sizes in bulk packs of 5 or 10 pieces. 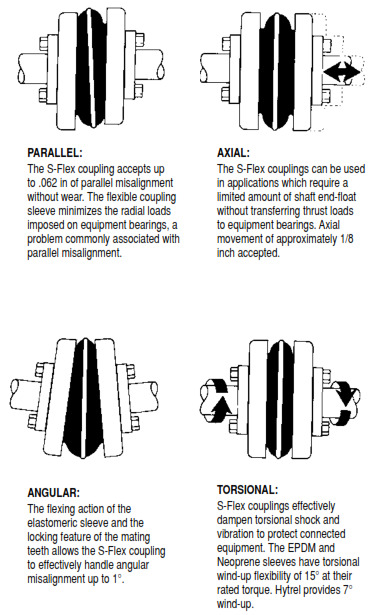 To get technical information on S-Flex couplings, please visit Lovejoy's S-Flex product page, or download the PDF catalog. Additionally, installation instructions and installation videos can be accessed here.